Comics Should Be Good: Comic Book Urban Legends Revealed #18! This is the eighteenth in a series of examinations of comic book urban legends and whether they are true or false. Click here for an archive of the previous seventeen. I wonder if the other way would have really had any better of a reaction? COMIC URBAN LEGEND: The Golden Age Green Lantern's name was originally Alan Ladd. When speaking about the origins of the original Green Lantern, Bill Finger always recalled that his original identity was to be "Alan Ladd," based on "Aladdin," but editor Sheldon Mayer insisted that no one would believe such a name and changed it to "Alan Scott." Well, first off, by this point in time, Alan Ladd had been acting in films for eight or so years already, but he was not very well-known, so I can reasonably believe that no one was familiar with him. NODELL: What I had in mind was, first of all, having The Green Lantern's incantation as an oath. Now, I had to give the character a name, so I looked through the New York telephone books, and got through "Alan," which I held onto, and then I came onto "Scott." So it was Alan Scott, that's the name I gave him. RT: You don't remember another possible name, "Alan Ladd," as various versions of the story relate? NODELL: No, I didn't know anything about it. I came up with Alan Scott, and I kept that. The storyline would be about an engineer. He was a graduate of college. I didn't know what kind of engineering it would be, but he was an engineer in that he helped build bridges and all. Now this is quite clearly a case of me choosing to believe one creator's recollection over another's, but in the rest of the interview, Nodell is quite specific about past events, and they all check out, so I am willing to take the leap of faith and believe that the creator of Green Lantern remembered the Alan Scott story best. In addition, this certainly leaves open the possibility that Bill Finger SUGGESTED to Sheldon Mayer the name "Alan Ladd," and Finger told him it was too much. The only thing that I am "debunking" is the idea that his name WAS Alan Ladd at one point, and then they changed it. COMIC URBAN LEGEND: Elliot S! Maggin's big break came from a story he got from Jeph Loeb! One of Elliot S! 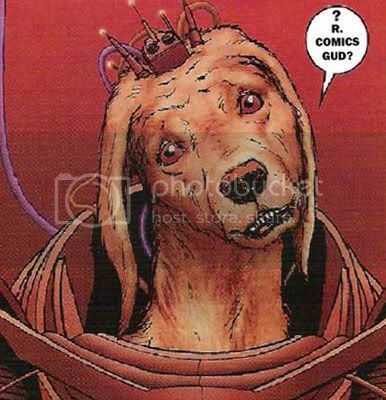 Maggin's first stories for DC (specifically, it apepars to have been his second ever!) was the classic "Must There Be a Superman?" 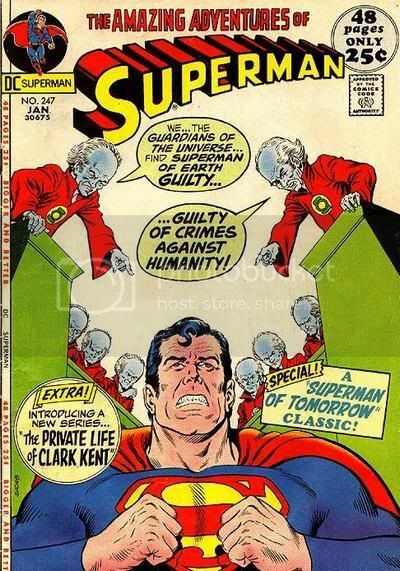 from 1972 (Superman #247), where the Guardians of the Universe cause Superman to question whether his constant assistance to the human race actually had some effect on IMPEDING human progress. It is a very interesting tale, and definitely one that was a bit more sophisticated than other Superman stories of the time, and this is reflected in the comic being collected in "The Greatest Superman Stories Ever Told." Mark Waid has stated that this issue was one of his inspirations for Kingdom Come. The funny thing was, though, was that it wasn't Maggin's idea! I have a friend named Jeph. You know Jeph. I was maybe nineteen or twenty and he was maybe twelve or thirteen and I was a student at this college and Jeph's stepdad was a big muckamuck at the college and stepdad and I made friends. I went over to stepdad's house for dinner one day and Jeph and I got to talking there about our mutual love for super-heroes and their stories. We came up with a nifty story over mom and stepdad's dinner table. See, I'd just sold my first comic-book script, a Green Arrow story called "What Can One Man Do?" and I had a problem. I had a meeting soon with Julius Schwartz, the Bard of Bards, to see whether I was a one-trick pony or I could do this sort of thing again. I had to come up with a hit-it-outta-the-park idea for a Superman story or else spend the next three years in law school. I guess I told Jeph a few of my ideas and I guess Jeph told me a few of his. And Jeph came up with this thing he called "Why Must There Be a Superman?" It was about the Guardians of the Universe planting a new idea in Big Blue's head. The idea was that maybe, in his zeal to preserve life and ease the path of the human race, Superman was keeping ordinary everday good humans from growing on their own. Maybe he was killing the butterfly by helping it out of the chrysalis. Not for sure, but just maybe. That was Jeph's idea. So I went to Gotham, to see the Bard and I had maybe a dozen little germs of ideas packed under my scalp. I'd try this one on him. I'd toss him that one. I'd pitch him another one. Some of them he liked; some of them he didn't. Some of them inspired ideas of the Bard's own; some of them made him snort or snore. By the end of a couple of hours - they were a loud, intense couple of hours, as hours I spent with the Bard of Bards always would be - I was emotionally exhausted and still he wanted to hear more. So I dredged up this idea about what might happen if the Guardians came calling on Superman with the tiniest little criticism of how he was doing his job. Now you're talking fresh stuff, the old man let me know. He got excited. He yanked people in from the hall and made me repeat the idea for them. I called the story "Must There Be a Superman?" and Saint Curt and Murphy drew it and it made me happy and I put words in Superman's mouth pretty much steadily for the next fifteen years and never went to law school. And I swear I did not have a clue where the idea had come from. Who knows where ideas come from anyway? I didn't remember - still don't remember, in fact, but I believe Jeph - until Jeph told me about his contribution years later. Like twenty or so years later. Jeph has never suffered, I don't believe, for my inconsiderate oversight, and in fact has always been my friend. He's done well, too. With his buddy Matthew he wrote the first great super-hero movie of the modern period, Commando with Arnold Schwarzenegger, and lots of other great stuff. And one day later on I was editor of Jeph's first comic-book series of his own, an eight-issue masterpiece with Tim Sale called Challengers of the Unknown. Now he writes for Hollywood and he writes for DC and Marvel and he's happy and he's still my friend, and now I get to make this right too. 10 years later, I was working with Tim Sale on Challengers of the Unknown, Elliot was living in California, and we all went out to lunch together. There used to be a comic-book store right around the corner from my office, so we went to the comic-book store, and Elliot, flitting through the back-issue bins, pulled out "Must There Be a Superman?." He said, "This was always one of my favorite stories." And I said, "It was always one of mine, too, and I always wondered why you told the story that I sent to you." And he turned pale. I said, "Elliot, please. (A) It was so long ago, and (B) you were so helpful, and (C) if I get anywhere in the comic-book business it's because of your advice and friendship." But he was just absolutely flabbergasted - in utter shock. And as we went back to have lunch, every 5 minutes he would look at me and he would say, "I can't believe that I did that." And I would just say, "Elliot, I don't care. I was really flattered that I had come up with an idea that you might use." I guess ideas really DO come from all sorts of places! And the Teen Wolf movies. The "Sins Past" thing seems to have changed mid-storyline, as the first issue givens the twins powers that are more akin to Spidey's than the Goblin, and then there's that last-page reveal of the male twin in which he looks just like Peter Parker, only to completely change appearance later on. Was this a case of the Spider-Man editor okaying Peter as the father but Higher Marvel quoshing it after the issue came out? Or did JMS not tell them until later? Or did Marvel editorial not understand the story at first (this has happened in the past)? It's weird to see a storyline apparently completely changing tack while in progress, and the explanation given by JMS doesn't quite cover it to my satisfaction. I wonder what everyone's favorite Jeph Loeb-hater will say about that nugget - Loeb, making up stories when he was 13! That's actually an interesting idea. Pretty sad the dude peaked at 13, though. Even though I'm known for hating Loeb's work, I actually wrote a positive review for a Jeph Loeb book on my blog recently, by the way! I thought *I* was everyone's favorite Loeb hata! Geez, I've got work to do, then. Wow. I never realised the queue was so long. And there I'd been cutting back on the Loeb-hate lately. Even though Supergirl #2 only fails to be the worst comic ever written because basically it's too dull. I'm reviewing Batman: Long Halloween next on my blog, just picked it up from the library. My Loeb-loving acquaintances swear it'll turn me around on Loeb, so we'll see. It's to the point, Mari, where I often feel like the biggest Loeb FAN just because I don't hate his work with a passion of a thousand suns...hehe. "It's to the point, Mari, where I often feel like the biggest Loeb FAN just because I don't hate his work with a passion of a thousand suns...hehe." Sorry T, The Long Halloween would have been a tense and exciting murder mystery, if it hadn't have been written by a total hack. Marionette went over to my blog and actually accused me of being too EASY on Loeb! Never heard that one before. Maybe I'm not the biggest Loeb hata after all! The All Star Treatment Revealed! League of Extraordinary Gentlemen for Today!